The magnetic force is a strange animal. The F = q(E+v×B) = qE+qv×B formula implies that both its direction as well as its magnitude depend on the direction and the magnitude of the motion of the charge. The magnetic force is, just like the electric force, still proportional to the amount of charge (q), but then we have not one but two vectors co-determining its direction and magnitude, as expressed by the vector product v×B = |v|·|B|·sinθ = v·B·sinθ. Diagram (b) below represents frame S’, which coincides with the reference frame of the charge, so now it’s the wire that’s moving past the particle, instead of the other way around. Because of relativity, all of our variables transform: we have time dilation, length contraction, and relativistic mass, as I explained in my posts on special relativity. So we cannot take any of the variables for granted and so we prime all of them: in S’, we have I’, v’, etcetera, and so we need to calculate their values using the Lorentz transformation rules. Now, we know that the absolute speed of light connects both pictures, but that’s not enough to explain what’s going on. We need some other anchoring principle as well. We have such anchor: charges are always the same, moving or not. They are indestructible. They are never lost or created: they move from place to place but never appear from nowhere. In short, charge is conserved. So we also need to look at charge densities and see what happens to them. The illustration above shows the current I going in the conventional direction, so that’s opposite to the actual direction of travel of the free drifting electrons. It’s a convention that makes sense because of all our other conventions, such as the right-hand rule for our vector cross-product v×B above, so we won’t touch it. Having said that, the illustration shows what’s going on in S: the positive charges in the wire don’t move, so we have some charge density ρ+ and a velocity v+ = 0. The electrons, on the other hand, do move, and so we have some charge density ρ− and a velocity v− = v. Now, we’re looking at an uncharged wire, so ρ+ must be equal to −ρ−. So the situation is rather simple: we have a current causing a magnetic field, and the force on our moving charge q(−) is F = v0×B. However, the same situation looks very different from the S’ perspective: our q(−) charge is not moving and, therefore, there can be no magnetic force. Hence, if there’s any force on the particle, it must come from an electric field. But what electric field? If the wire is neutral, there can be no electric flux from it. You’ll say: why should there be a force on it? Forces also look different in different reference frames, don’t they? 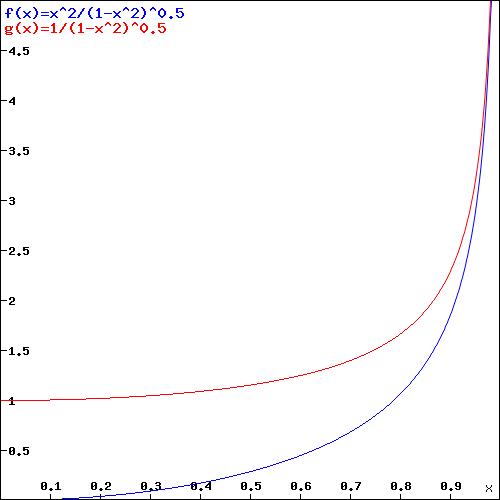 They do: they’re subject to the same Lorentz transformation rules: F’ = γF with γ = (1−v2/c2)−1/2. So, yes, the force looks different, but they surely do not disappear! Especially not because the typical drift velocity of electrons in a conductor is exceedingly slow. In fact, it’s usually measured in centimeter per hour and, hence, the Lorentz factor γ is extremely close to 1. 🙂 So the forces in the two reference frames should be nearly identical. Hence, the conclusion must be that the electromagnetic force in the S’ reference frame appears as some electric force, which implies that… Well… The bold conclusion is that our wire must be charged in S’ and, therefore, causes an electric field, rather than a magnetic field! To simplify the calculations involved, Feynman analyzes a special case: he equates v with v0. So that gives us the variables in diagram (b) above: in reference frame S’, we have some charge density ρ’+ and a velocity v’+ = –v0 = −v, while the electrons don’t seem to move: we have some charge density ρ’− but the velocity v’− = 0. As mentioned above, we cannot assume that ρ’+ = ρ+ or that ρ’− = ρ− and, therefore, we cannot assume that I = I’. […] OK. Now that we’ve explained all the variables involved, we’re ready to actually do the calculation. The crux of the matter is that a charge density is some number expressed per unit volume, and that the volume changes because of the relativistic contraction of distances. That’s what’s shown below. As I mentioned in my posts on relativity, of all of the effects of relativity, length contraction is probably the most difficult to grasp. How comes the same amount of charge is suddenly spread over a smaller volume? Well… It is what it is, and I cannot say more about it than what I already said in the mentioned posts, so let’s get on with it. The (a) and (b) situations above describe the same piece of wire: its length and area, as measured in the stationary reference frame S, is L0 and A0 respectively, so its volume is L0·A0. If we denote the total charge in this volume as Q, then the charge density ρ0 will be measured as ρ0 = Q/(L0·A0). Why? If the total charge Q is the same in both S and S’, then Q = ρ0·L0·A0 must be equal to ρ·L·A0, with L the measured length in the S’ reference frame. Now, because of the relativistic length contraction effect, we know that L = L0·(1−v2/c2)1/2 and, therefore, ρ must be equal to ρ = ρ0·(1−v2/c2)−1/2. Capito? Now, as far as I am concerned, that’s it. But… Well… Of course, we should generalize the analysis for v ≠ v0. However, I’ll refer you to Feynman for that. He also takes care of the remainder of the calculations you’d probably want to see, like a formula which show that the force on the charge in S’ is indeed what we would expect it to be. Feynman also shows that all other variables we can possibly calculate in the S’ reference frame, such as the momentum of the charged particle after the force has acted on it for some time all turn out be what we’d expect them to be according to special relativity. This entry was posted in Physics and tagged electromagnetism and relativity, relativity of electric and magnetic fields. Bookmark the permalink.